Our mission is to excel in providing community-based behavioral healthcare services in such an effective manner that our consumers will be empowered to pursue an optimal quality of life. As a comprehensive mental healthcare center, Pine Belt offers specialized services for children and their families, adults, the elderly, persons with developmental disabilities, persons with chemical dependencies and persons with a serious mental illness. We offer both in-patient and out-patient comprehensive chemical dependency services. Our treatment programs provide Individual, Group and Family Counseling as well as other services and counseling options. We offer many services and programs catered to children and adolescents’ unique mental health needs including Achieving Our Potential Programs, Individual Case Management, Crisis Intervention and Emergency Services, and much more. We offer Day Services, Prevocational Services, Supervised Living and Supported Employment programs to individuals with an intellectual and/or developmental disability. We offer an array of services for adults including Senior Day Services, Adult Residential Services, and more. Interested in a mental health career? We are exceptionally well-credentialed and have won numerous awards for our efforts within our target communities. The results speak for themselves. 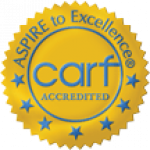 Pine Belt holds the highest level of accreditation of its services from the Commission on Accreditation of Rehabilitation Facilities. PBMHR is also a member of Mental Health Corporations of America, Inc. MHCA includes in its network only the highest quality behavioral healthcare organizations in the country. These achievements demonstrate that Pine Belt meets and exceeds high quality standards of care. Pine Belt is a member of the National Council for Community Behavioral Healthcare, the oldest and largest trade association representing the nation’s providers of mental health, substance abuse and developmental disability services. Pine Belt Mental Healthcare Resources is certified by the State of Mississippi Department of Mental Health. Just like a person can develop illnesses of the body, a person can develop illnesses of the brain that affect thoughts and behavior and interfere with normal living. Seeing and hearing things that do not exist are examples of hallucinations. Delusions are fixed false beliefs that cannot be changed by outside evidence. Set up an appointment today by calling the closest facility in your area. This information can be found on our Contact page. © 2018 Pine Belt Mental Health Resources. All rights reserved.